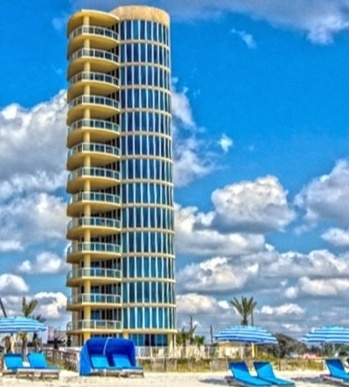 Opal Condominiums is an upscale development in Orange Beach, Alabama. Located centrally to every convenience that Orange Beach has to offer, Opal is a well-known and distinctive luxury condominium complex. Each floor of this sparkling building contains only one residence, each with five bedrooms and five and a half baths. With over four thousand square feet of living area in each unit, floor-to-ceiling doors and windows create an immersive and open feel to each residence in Opal. It's almost as if these condos blend into the horizon of the turquoise Gulf of Mexico. Keep reading here about the high-end building quality and amenities of Opal condominiums. Dreaming of your very own waterfront property? Browse all Opal condos for sale below, or learn about other condo developments in Orange Beach. Sign up now for complete access to our Orange Beach AL real estate listings, including detailed property specs, area maps, photos and more! Registration also enables you to bookmark your favorite Orange Beach condominiums, share listings with friends & family, and save your preferred search parameters to save you time on your next visit. Only the finest building materials can be found in Opal condos. Custom cabinetry and beautiful finishes are among the reasons that the interiors of each Opal condo are so desirable. This rent-restricted development also boasts more-than-spacious split-floor plans, custom closets, and even two gas fireplaces. Amenities available to Opal condo owners include a hot tub, indoor/outdoor pools, gated entrance, private garages, and security coded elevator access. Built in 2007, Opal contains only twelve units total, and because of the additional rent restriction, this community provides for a perfect luxury year-round residence or second home. Located in the heart of Orange Beach, Alabama, Opal condos and its real estate occupies a choice location in the community. From the higher floors, the floor-to-ceiling windows of Opal condos provide a stunning view of the State Park to the north, overlooking Little Lake and the Hugh S. Branyon trails. Opal is near all the shops and restaurants one could ask for, and its central location also ensures that many amenities and recreation spots are within walking distance. Opal stands out among the condos on the strip for its unique and modern architecture and beautiful design. Opal is truly a luxury experience for the discerning buyer. Call today for a private showing of Opal condos and its amenities. Contact the Gatti Real Estate Team today to learn more about the luxury condo market in Orange Beach and surrounding Gulf Coast communities. We are here to help.